Request an item in advance to save time at BAAPT meetings! 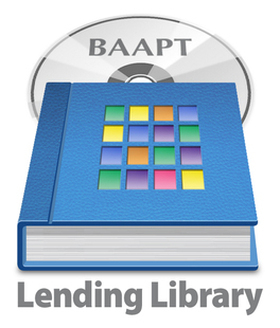 Borrowers must leave a deposit for each item borrowed from the BAAPT Lending Library. Checks only, please. RATES: $25 per book, $25 per audiotape or CD, $50 per videotape, and $100 per manual. "Manual" refers to a large loose leaf binder. However, not all manuals are in that format. A maximum of 4 items may be signed out at any one time. to the Resources Director at resources@baapt.org. when you arrive at the next BAAPT meeting. View our interactive library index.